April 10, 2019 - The digital marketer's #1 daily briefing! Warning: A major affiliate network is going through a financial crisis, stop sending traffic to their offers. There’s something you should know before broadcasting your next Sponsored Message Campaign. The CEO that makes only $1.40 a year. We have some bad news for many of our readers. The very famous affiliate network Mundo Media seems to be sliding down the path of no return. The company has started contacting active affiliates and telling them to stop sending traffic to any of their offers right away, warning them that any traffic sent after this message will not be paid. So yeah, if you are running campaigns with Mundo and didn’t get the memo, STOP NOW! There’s no official statement just yet because nobody knows exactly what is happening, but it rarely bodes well for the future when a network tells its affiliates to stop traffic all of a sudden, does it? They are currently making some internal changes to stop operations and figuring out a plan before making a public announcement. Check with your affiliate manager to get updates for you specifically. Learn the lesson that you are not too big to fail in any industry. Practice safe bankroll management, aka don’t take financial risks that are too big for you. 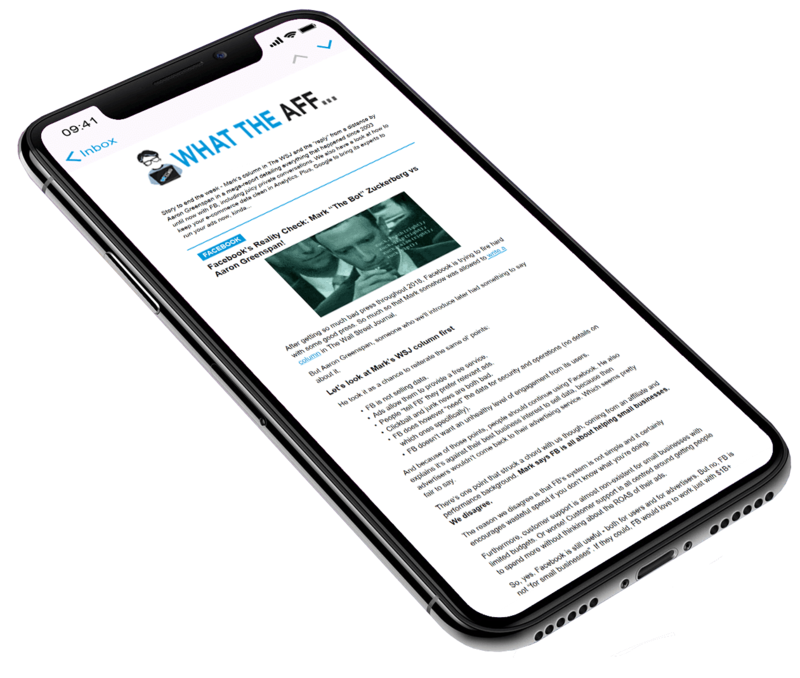 PS: You’re probably asking how we know… Well, there are 5,600+ industry people reading our newsletter and this news that came to our inbox yesterday from some reliable sources. PPS: This news has already started discussions in our FB Insiders group before it made it to our magazine. If you’re wondering how to get involved and join the discussion, well… it’s pretty easy: All you gotta do is refer 5 readers to get invited. Also, if you have more updates, hit us up! We’ll keep everyone posted. Do you run Sponsored Message Campaigns on Facebook? If you do, then there’s something you might want to be aware of: When running a sponsored message campaign with no exclusions, your message will also be sent out to people who have already unsubscribed from your bot. This can be confusing. Obviously, as Rutger Thole explained in his post, this makes no sense. But it is what it is and we have to live with it. FB will send sponsored messages to every person your business can send messages to, or anyone who has ever sent a message to your business on Messenger. This can lead to negative feedback from users that unsubscribed from your bot, subsequently putting your account in danger. So, the question is, how can you solve this issue? Make sure you tag everything that happens in your flow: General signups, subscribers with a lead score higher than X, a user who signs up for a webinar, who sent you a message, etc. Tag your unsubscribers: You can have two types of unsubscribers: the ones that unsubscribed themselves and the ones that you removed. Create a Dynamic Custom Audience using the unsubscribers tag. Exclude this Custom Audience from your Sponsored Messages Campaign. Easy but effective. This will help you avoid that negative feedback from users who unsubscribed, and also the crappy subscribers you removed from your bot. Since November 2018, advertisers have been allowed to create image link ads with a 1:1 aspect ratio using the Marketing API. However, starting from April 30, new ads using the 191×100 crop specifications will no longer be supported. You can leverage any aspect ratio between 1.91:1 and 1:1 without cropping the image. Any image taller than 1:1 or wider than 1.91:1 will still need to be cropped. The 191×100 crop spec will no longer be available in the newest Ads API version. The recommended crop key will be 100×100. According to FB, images with a 1:1 ratio perform better in terms of CTR (Click through rate) and CR (Conversion rate) when compared to 1.91:1 aspect ratio. However, there are some differences with regards to the placements. The following ones will render the taller image as-is: Mobile Feed (Android and iOS) app versions 194 and up, Desktop Feed, Desktop Right Hand Column, FBLite, Marketplace Mobile, Audience Network. While, these ones will see padded landscape images: Mobile Feed (Android and iOS) app versions 193 and below, Ads in Instant Article, Messenger Ads. Also, the following placements do not support the 1:1 ratio: Offer ads, Event ads, Ads with overlays, Single image dynamic ads, Placement Asset Customization 2 (PAC2), Stock Images, Donation ads. Yes, yes, you had to wait longer for this one but we’re also trying to figure out the right pace to make these episodes. Still, it’s something worth waiting for… at least we believe so! Paul’s hands-down one of the best people to talk business with, especially about Facebook Ads on a performance basis. He’s a taxi driver turned super-affiliate, speaker and, we kid you not, taxi company owner. Yes, he used the affiliate money to start his own taxi company, haha. How Paul went from a taxi driver that has no idea about tracking or ads to super-affiliate. Facebook policy changes from 2018 to 2019 and how to manage them. What FB cares about to give you good traffic. Answering the question of what matters more for him: “Hacking the algorithm” or good creatives. When and how to use automated rules for Facebook campaigns. What verticals are good on FB right now. How to do competitive research on Facebook, aka spy on your competition. Lone wolves versus full-blown operations for media-buying. 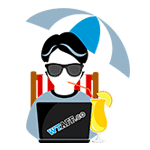 Building teams and processes for any online business, including some tips on how The WTAFF Crew works to bring out this daily briefing. Watch the full episode here – The Real State Of Facebook Ads in 2019 with Paul Jeyapal. Give it a like, leave a comment telling us who we should have on the show next and we’ll try to make it happen! Have a question for Paul? Ask in the comments! Don’t forget to subscribe for more Stacked Marketing Show episodes! PS: If you want audio only, it’s on SoundCloud right here. Are you still manually placing all your tracking codes on your websites and landers? Or are you using a tag management system such as Google Tag Manager? Google Tag Manager is an awesome tool and once you start using it, you can’t imagine a work day without it. It allows a non-techie person to manage all tracking codes, control both simple and complex rules, and much more. Someone from your team wants to start tracking a new lead form? Easy! Gotta implement a heat map tracking tool? No problem! You no longer have to wait several weeks for a developer to become available. Simply put, GTM is a one-stop shop for all your tracking management needs. You simply create a container, setup triggers, publish it and you are done without ever having to sign-in to your website’s backend. To get you started and to make things a bit easier for you, here are some useful GTM containers that can help you improve your website functionality and tracking. Track contact form link clicks. Track copied text from your website. Add link to website in copied text. You can simply download these containers and import them to as many GTM accounts you want. In Google Tag Manager, click the admin tab. Under Container, click “Import Container”. Select a file to import -> choose the file you just downloaded. Choose workspace -> Existing -> Select your existing workspace. Choose an import option -> Merge. Next, click on variables in your GTM workspace. Under User-Defined Variables, look for a variable named UA-XXXXXXXX-X (or something similar). Change the name and value of the variable in your Google Analytics UA code. To locate your UA code, you can visit Google Analytics > Admin > Property > Tracking Info > Tracking Code. If you are already using GTM for your tracking management, great! You are definitely on the right track. If you’re not, maybe this will convince you to get started and you will realize how simple, quick and powerful GTM is. If you’re facing any issues while importing these containers to your account, head here for more info. Tech giants might promise complete privacy on their platforms but we all know that’s never going to the case. Your data is what keeps their business running. But the good news is that you might not have to solely rely on them to safeguard your data and ensure your privacy. 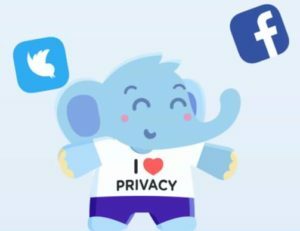 In what could be a nightmare to these tech platforms, a startup company has stealthily emerged from the dark to launch its Jumbo privacy assistant app. It automatically adjusts 30 Facebook privacy settings to give you more protection. It deletes your old tweets after saving them to your phone. It erases your Google Search and Amazon Alexa history. Similar clean-up features for Instagram and Tinder are also being added and will be launched soon. The big question is: Will these tech giants allow Jumbo to operate or will they ban it from their platforms? Facebook, Google and the others should have ideally built these features themselves or made them easier to use but as we said, data is what keeps the ball rolling for them. This should be a very interesting watch to see which way the cookie crumbles. Ahrefs first launched its Content Explorer in 2014 and grew its searchable and filterable database of web pages to 1.1B. Last week, they announced the launch of Content Explorer 2.0. As their CMO Tim Soulo stresses, it’s not just another update. Rather, a rebuild from the ground up. Broken (404 & 410) pages. The number of dead pages are growing by 5M per month, often stemming from a mixture of bad site migrations, the deletion of content in bulk following a content audit, or the expiration of a domain. This tool now lets you search through the content of broken (404, 410 & NXDOMAIN) pages with a filter. In turn, this allows you to review all the high-quality backlinks associated with such pages. Filter for broken pages only. Find out‐of‐date pages with lots of backlinks. Find old, but recently‐updated pages about a given topic. This will allow you to track brand mentions over time. Check the publishing frequency of you vs. your competitors. Find topics with a lot of outreach potential. New in‐line charts. SEO metrics for each page have been given a visual emphasis with in-line charts. Among others, you will find charts for referring domains and traffic. UI and filtering improvements. This will allow for 1‐click filtering of results by website or author name. The UI has also been upgraded with better date filters. 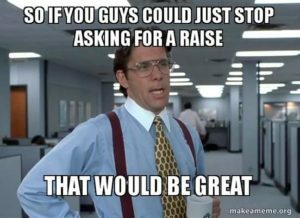 From a business owners’ point of view, a perfect employee would be the one that is highly skilled, hard-working aaand… not so demanding where remuneration is concerned. If you’re looking for this perfect breed of employee, you might want to look into Twitter’s work-force. Where exactly? Right at the top of the hierarchy! Exactly, we are talking about the CEO. Jack Dorsey received a salary of just $1.40 in 2018. A nod to original 140 characters limit of Twitter. This isn’t even the first year that Jack has received this microscopic wage. The story stems back to 2015. Moreover, it appears that Twitter isn’t the only company handing him such a compact wage packet… He is also the CEO of Square, the mobile payments system, which paid him a $2.75 salary in 2017. We are kinda worried about this. We heard that Jack Dorsey only eats one meal per day. Is this because of him struggling on the bread line? Well, fortunately not. You don’t have to feel too sorry for poor old Jack. This year he made a healthy $80M by selling Square shares. So, that one meal per day thing is just a healthy habit!